On August 15, 2012, at age 89, Isaac “Ike” Edward completed a specially commissioned work of art for the National Civil Rights Museum in Memphis, Tenn. Widely renowned for the beautiful designs, intricate details and masterful craftsmanship of his Mardi Gras Indian suits, Ike was sought out by the museum to create a masterpiece representing early 20th century Mardi Gras Indian culture. His work, now proudly displayed, is the only piece of its kind in the museum’s permanent collection. As a Mardi Gras Indian himself, with eight decades of experience and participation, Ike is among the few people today who truly understand the culture and traditions. Most observers assume that the stylized dances and colorful suits of parading Indians are simply an extravagant display of friends having a good time. In reality, the seemingly free-form procession is actually an intensely coordinated, highly communicative ritual. 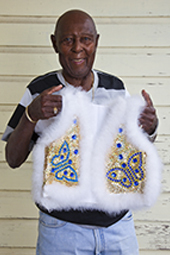 Ike has made it his mission to train future generations of Mardi Gras Indians on the intricate details and sewing required to create the legendary suits and continue the legacy. Through life experience, Ike has learned that the traditions of our ancestors are more than mere history, but a living record of our place on earth. Traditions give us stability and purpose by telling us about the people who enabled our very existence. Ike recognizes the deep significance of Mardi Gras Indian culture – that each sewn bead on a piece of cloth is not a decoration, but part of an elaborate form of art that requires sincere dedication and devotion … a tradition that Ike Edward ensures will continue for generations to come. Isaac “Ike” Edward … Peoples Health Champion.